The dirty lunchable secret is that M&S — while good at snacks in general — are quite bad at sandwiches and have been for a long time. They aren’t awful: this I know bcz I’ve eaten 1 x metric fvcktonne in my years on this earth. But they’re not worth going a long way out of your way for. 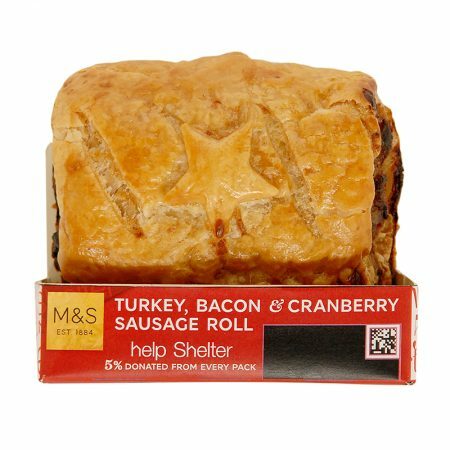 I didn’t bother trying the Turkey Feast bcz every time I veer away from Pret’s in this wise I am disappointed — plus I know M&S is bad for overegging the too-salty bacon. And I didn’t try the Gluten-Free Turkey Feast bcz [something something] yule without glyuten. Here’s what I tried at various points: the Turkey Bacon and Cranberry Sausage Roll, the Brie and Grape w/Ruby Port Chutney on Soft Oatmeal Bread, and… but no, I shall keep the last for the last. Best description of the turkey bacon and cranberry sausage roll is tbh strange: the pastry is close to that good-not-bad melt-in-mouth texture of scary canteen sossrolls down the ages (scary bcz of the amount of molten fat involved); the sausage (made of turkey plus bacon and other pork products) is studded with whole cranberries and pork and bacon bits, and while by no means inedible, not really something I’d hurry back for either. (The M&S roll I’d actually hurry back for, please note, is the legendary black pudding sr, a ltd end trial which succeeded with me but apparently not the public at large) (at large in Hackney anyway). The brie and grape w/ruby port chutney on soft oatmeal bread is even stranger, as the full description perhaps gets across: “brie cheese and red grapes with a grape and ruby port chutney and lettuce on oatmeal bread.” These five flavours really don’t go with one another. “Confused,” as they say on masterchef. But — OK here we go! — the M&S Stollen Bites are AMAZING. Probably a bit too soft and cakey for the real stollen experience (“fruit bread squares” is the giveaway), but real experience is overrated, unlike “soaked in rum and walnuts, with a soft marzipan centre, finished with a sweet dusting”. It is we that are finished, ambassador.